Equatorial Guinea’s President, Obiang Nguema Mbasogo, has appointed 18 new Secretaries of State in various ministerial departments in accordance with the constitutional reform. Equatorial Guinea’s constitutional reform was approved in a referendum by 97.7 percent of voters November 2011. It called for the creation of new governmental institutions, such as the Senate, and the formation of a new cabinet. Secretary of State in Charge of Roads, Tolls, Airport Infrastructures in the Government Presidency, Mr. Luis Oyono Esono. Secretary of State for Consular Affairs in the Ministry of Foreign Affairs and Cooperation, Mr. Angel Mokara Moleila. Secretary of State of the Ministry of Justice, Religious Affairs and Penitentiary Institutions, Mr. Antonio Nzambi Nlonga. Secretary of State in Charge of the General State Treasury in the Ministry of Finance and Budgets, Mr. Eucario Bakale Angue. Secretary of State in Charge of Financial Control Services in the Ministry of Finance and Budgets, Mr. Eusebio Ipico Penda. Secretary of State for Technology and Telecommunications in the Ministry of Transportation, Technology, Posts and Telecommunications, Mr. Carmelo Martin Modu Ebuka. Secretary of State in Charge of Primary and Secondary Education at the Ministry of Education and Science, Mr. Salvador Nguema Mangue. Secretary of State in Charge of University Education in the Ministry of Education and Science, Mr. Jose Cosme Okenve Mbomio. Secretary of State in Charge of Public Health and Health Planning in the Ministry of Health and Social Welfare, Mr. Praxedes Rabat Macambo. Secretary of State of Hospital Infrastructures, Medical Supplies and Medicines in the Ministry of Health and Social Welfare, Mr. Enrique Ovono Ondo. Secretary of State for Hospital Coordination and Assistance in the Ministry of Health and Social Welfare, Mr. Victor Sima Oyana. Secretary of State in Charge of Housing and Urban Development in the Ministry of Public Works and Infrastructures, Mr. Aurelio Mba Olo Andeme. Secretary of State for Industry at the Ministry of Mines, Industry and Energy, Mr. Miguel Angel Ondo Angue. Secretary of State in the Ministry of Agriculture and Forestry, Mr. Alfredo Mitogo Mitogo Ada. Secretary of State in the Ministry of Information, Press and Radio, Mr. Juan Noel Nsue Ondo. Secretary of State in the Ministry of Fisheries and Environment, Mr. Simon Osa Adugu. Secretary of State for Public Service in Charge of Human Resources in the Ministry of Public Service and Administrative Reform, Mrs. Amparo Mele Kolifa. Secretary of State in the Ministry of Youth and Sports, Mr. Ruslan Obiang Nsue. 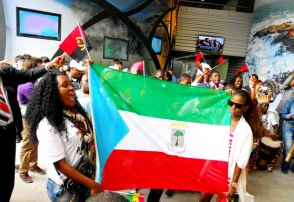 On May 25, Equatorial Guinea participated in the celebration of International Africa Day. West African nation has no political prisoners, citizens have unfettered Internet access. There were no credible reports of crime. There are no political prisoners in Equatorial Guinea, according to the Department of State’s Country Reports on Human Rights Practices for 2011, which was released today. The report documented several positive practices and developments in the country in a report that was more positive in tone and substance than in years past. Although the report included critical information on the ability of political opposition to challenge the ruling party, the conduct of the courts, and official corruption, it also gave the country clear credit for areas in which it has improved, attempted to improve, or traditionally been strong. The report indicated that uncensored news is more widely available in the country than critics claim. It also noted efforts to improve health conditions, protect women, children, the disabled and minorities, and improve the penal system. There are no political prisoners in the country. The government in June pardoned 22 prisoners serving long jail terms for plotting against the regime. The government recently renovated three prisons, and while conditions remain inadequate, they are improved. The largest prison has only 269 inmates. Prisoners generally have reasonable access to visitors and were permitted religious observances. The government appointed a local judge to serve as ombudsman to hear complaints about sentencing. The nation’s attorney general met with 90 percent of inmates in the largest prison to determine their dates of imprisonment, legal situation, sentencing dates, and state of health. The government signed a headquarters agreement with the International Committee of the Red Cross (ICRC) giving the international organization a permanent presence in the country. A foreign contractor is training police officers and their leaders on human rights, prevention of trafficking in persons, rule of law, appropriate use of force, and code of ethics. Evidence and feedback from expatriates, citizens, and community leaders indicated improvements in performance in human rights and professional conduct, particularly among younger officers who received the training. Although nearly all media are state controlled, foreign channels were not censored, were broadcast throughout the country, and included Radio France International, the BBC, and Radio Exterior, the international shortwave service from Spain. The government approved the establishment of an independent newspaper that was published infrequently throughout the year. International news reported that Juan Pedro Medene, a French language social program host, was terminated from his position on local television for mentioning Libya on a cultural show; however, the events of North Africa were widely discussed on radio, television, and in the newly approved independent newspaper, El Lector. Unlike in the previous year, there were no reports that the government forcibly evicted families from their homes to make room for roads and luxury housing developments. The government did not overtly limit participation of minorities in politics. Numerous public outreach efforts were undertaken to improve public awareness of the issues associated with violence and discrimination against women and children, discrimination against ethnic minorities, and discrimination against those with HIV/AIDS. The government conducted public awareness campaigns on women’s rights and domestic violence. In accordance with a 2009 law, family courts were created to deal with cases of violence against women; however, domestic violence cases continued to be handled by district courts. On occasion, police organized workshops on family violence, and public marches against violence against women were authorized. The government has reduced maternal mortality and the country is on track to achieve its Millennium Development Goal due in large part to a successful malaria eradication campaign and improved care in hospitals. The government continued to partner with a foreign oil company to undertake a multimillion-dollar school renovation program and work with a foreign country to reform outdated curriculum materials. The Ministry of Social Affairs and the Promotion of Women operated several programs to deter child marriage. The government and the Catholic Church worked together to provide care for persons with mental disabilities. The country’s first lady gave several highly publicized donations to help persons living with disabilities. The government worked to protect the rights of persons with disabilities, including broadcasting public service announcements regarding rights of persons with disabilities. The government vigorously enforced laws prohibiting child labor. The government respected religious freedom in law and in practice. Equatorial Guinea’s president, Obiang Nguema Mbasogo, has appointed Teodoro Nguema Obiang Mangue, his son who until yesterday was Equatorial Guinea’s Minister of Agriculture and Forestry, to the position of First Vice President in charge of National Defense and State Security. He will exercise general oversight over defense and security, the day-to-day management of which will be the responsibility of other ministers. Holding the office of First Vice President does not place Mr. Nguema first in the order of succession to the presidency. That position is occupied by Ignacio Milam Tang, Equatorial Guinea’s former prime minister, who was appointed to the office of vice-president. The vice-presidency is a new office established under the new constitution. Vicente Ehate Tomi replaced Mr. Milam Tang as Prime Minister. Mr. Nguema had resigned his portfolio, as did the rest of Equatorial Guinea’s cabinet, as a formality to give President Obiang a free hand to form a new cabinet under the new constitution. The president will spend the next few days appointing officials to their new positions. The constitutional reform also called for the creation of new governmental institutions such as the Senate, the State Council and the Council for Economic and Social Development. Equatorial Guinea’s constitutional reform was approved in a referendum by 97.7 percent of voters November 2011. It aimed to promote government transparency and improve the country’s judicial and executive branches. Sibacha Bueicheku, chairman of the Union for Democracy and Social Development party and deputy coordinator of the Common Front of the Opposition in Exile, has returned to Equatorial Guinea after living abroad in Spain for 35 years. Bueicheku told local media that he was struck by the dramatic changes in the country. “Since my arrival here, I’m completely amazed because the reality is different from the information given to us by those who are outside the country,” he said. He said that western media and critics of Equatorial Guinea’s government had misrepresented the situation in the country. Bueicheku praised the country’s progress in improving infrastructure and raising the standard of living in the country as well as its democratic development, and encouraged other opposition figures in self-imposed exile to return home and promote peace. “This is what we have to do, unite, because they are not going to fix our society from abroad. Everything is a pure distraction,” he said. President Obiang has long encouraged Equatoguineans living abroad to return to the country. The government of Equatorial Guinea has implemented several reform and infrastructure projects in the recent years as part of the country’s Horizon 2020 development plan, which was launched by President Obiang Nguema Mbasogo in 2007. Some of the projects include the development of new African Union headquarters in Addis Ababa; the establishment of GECOMSA, a telecom company with improved wireless and internet connectivity; constitutional reform; and an expansion to the liquefied natural gas (LNG) Train project. Equatorial Guinea will participate in the annual 65th World Health Assembly, which will be held at the Palais de Nations in Geneva from May 21st through the 26th. This year’s assembly will focus primarily on public health issues such as universal health care, the Millennium Development Goals and noncommunicable diseases. In addition, the Health Assembly will address reform and development within the World Health Organization. Equatorial Guinea’s delegation will be led by Salomon Nguema Owono, the Third Deputy Prime Minister and Minister of State for Health and Social Welfare in the Social and Human rights Sector. Thérèse Aya N’Dri Yoman, Minister of Health and AIDS Control in the Republic of Ivory Coast, and Jonas Gahr Støre, Minister of Foreign Affairs of Norway and former Chief of Staff of the Director General of the WHO, will also attend the Health Assembly. Equatorial Guinea’s participation in the 65th World Health Assembly is an indicator of the government’s commitment to meet the goals of the Horizon 2020 development plan set by President Obiang Nguema Mbasogo. Equatorial Guinea has heavily invested in its public health sector and contributed to international efforts to improve public health, particularly in Africa. The government donated $15.8 million to reduce malaria in children last May 2011. In 2010, the government donated $1.5 million and a headquarters facility to the World Health Organization to support research for global health. Equatorial Guinea has also provided technical assistance to the local United Nations Population Fund (UNFPA) to improve the effectiveness of its assistance program and has implemented a host of health programs geared toward improving the health of Equatorial Guineans. Basic health indicators such as rates of infant and child mortality have beenimproving steadily in the country, and the government is widely recognized for its efforts to eradicate malaria. In preparation for Expo 2012 Yeosu, which will take place in South Korea from May 12 to August 12, 2012, Equatorial Guinea met in Angola with other participating African countries to discuss current organizational issues. The participants drafted a memorandum that will be presented to the International Bureau of the exhibit. According to Angolan Commissioner Albina Assis, one of the pressing issues for some of the African countries is covering the high cost of customs fees. There are a total of 105 countries participating in the 2012 Yeosu Expo, 25 of which are African countries. The theme of this year’s international exposition is “The Living Ocean and Coast: Diversity of Resources and Renewable Energies,” dedicated to promoting sustainability and protecting the environment. Equatorial Guinea, along with neighboring African countries, has worked to further expand trade and business in natural resources such as oil and gas in the recent months. This conference provides the opportunity to “promote bilateral exchanges in technologies and human resources to foster closer economic ties,” according to the Korea Times. Heads of State and delegates from Africa and Latin America will come together from August 20-24, 2012, in Malabo, the capital of Equatorial Guinea, for the 9th Leon H. Sullivan Summit. The Sullivan Summits are organized by the Leon H. Sullivan Foundation and held biennially in an African nation to exchange views on important issues, highlight best practices, stimulate discussion, define opportunities, promote private enterprise and foster high-level strategic partnerships. It is the first internationally recognized summit of world leaders convened on African soil by a private foundation. The first summit convened in 1991. Attendees at past summits have included President George W. Bush and President William J. Clinton. The “Africa Rising” themed Summit will address human rights issues affecting African nations, including food and human security, freedom of press, education, building economies of opportunity and others. It will center on the achievements and progress of the African continent. The Leon H. Sullivan Summit will be held at the Sipopo Conference Center, Equatorial Guinea’s newest facility for hosting large-scale international events. Equatorial Guinea has assumed an increasingly active role in international affairs in the past year. It hosted the Africa Cup of Nations soccer tournament, the tournament’s 16-nation draw in the nation’s modern conference center, Sipopo. Sipopo has also hosted events associated with the African-South American Summit. It was the host of the African-South America Forum, at which ministers of foreign affairs from 65 countries came together, and it will host the summit at a later date this year. In June and July, Equatorial Guinea hosted the African Union Summit, also in Sipopo. The government of Equatorial Guinea today said that its courts acted properly in the malpractice conviction of Dr. Wenceslao Mansogo, rebutting claims by human rights groups that the trial was politically motivated. In a statement that detailed some of the evidence heard at trial, the government recounted events surrounding the death of Isilda Engo Mangue, who died of cardiac arrest while being prepared for a surgery. The court found that the victim died from improper administration of anesthesia and that the clinic did not have adequate personnel on hand during the surgery. The government noted that the case was brought by the family of the deceased and that the court functioned with complete independence. “The case has arisen from a most particular and private accusation from the family of the deceased patient, and was carried out under the guaranteed independence of the judiciary. The accused have been tried in the first instance, and can appeal the sentence, following the usual channels prescribed by the justice system,” said the government statement. The government noted that some of the accusations against Dr. Mansogo, including charges that the body of the deceased had been mutilated, were rejected by the court. The Provincial Court of Bata recently issued its judgment in the trial of Wenceslao Mansogo Alo and the anesthesiologist Asunción Asumu Mangue, both defendants in a case of criminal negligence arising from professional malpractice resulting in the death of the patient Isilda Engo Mangue. The press interest in this case stems from the fact that Dr. Mansogo is a known leader of the Convergence for Social Democracy (CPDS). This political formation has spread the idea that Mansogo trial is the result of political persecution. However, the case stems from solely from a private party’s accusation: the one made by the family of Mangue Isilda Engo, a patient who died in Dr. Mansogo’s clinic after suffering two heart attacks during an operation that the surgeon was to perform. The trial was conducted in the city of Bata, on April 9, 2012, by the criminal division of the Litoral (province) Provincial Court in the court of Judge Elisha Mengue Oyana Nvo. Dr. Wenceslao Mansogo was represented by attorneys Elijah Ponciano Mbomio Nvo and Elías Nzo Ondo, while the anesthetist was represented by attorney Santiago Mbasi Ondo. The prosecutor in the case, Claudio Ndongula Mesanga, previously requested a sentence of six years in prison. During the trial, the defendant disputed the conclusions of the report issued earlier by the technical committee chaired by Dr. Salomón Nguema Owono, which determined that the death of the deceased was caused by the anesthesia that was administered. He also argued that his clinic did not lack the professional or technical means to perform the planned surgery. For her part, the anesthetist, despite in spite of her disagreement with the expert report, acknowledged that the patient suffered two cardiac arrests during the preparation for the operation, a situation with which she was forced to call two professional colleagues from the Bata Regional Hospital (Drs. Apolinar González Pelayo and Asunción ion Edegu Edegue anesthetist), in the absence of assistance and personnel at the clinic where the operation was taking place. Those specialists also appeared as witnesses in the trial. Relatives of the victim, her husband, Julian Yekue Nsi, and her father, or father, Aba Gil Engo Abogo, also testified. he husband of the deceased said that when he went to collect the body he was given two different explanations for his wife’s death: one, that the deceased could not stand the anesthesia applied and a second, that the patient had died from cardiac arrest. The sentence records, as proven facts--among others--that coordination between the surgeon and anesthetist was not good, since the latter had to call two friends from a different clinic, when the patient had already suffered a second cardiac arrest, given the lack of coordination and lack of assistance because of the absence of staff assigned to the anesthesiology and resuscitation section. The statement also questions the urgency of the operation, the same day as the visit of the patient with her anesthesiologist, because Isilda Mangue’s condition was not serious. Similarly, the court rejected the claim that the genital organs of the deceased had been removed during the operation, a charge initially made against the doctor by the family of the deceased. The ruling specifically sentences the accused for recklessness arising from professional negligence resulting in death, with the following penalties: Dr. Wenceslao Mansogo Alo is convicted and sentenced to three years imprisonment at lower-medium level, suspension from the practice of his profession for five years and a fine of 1,500,000 cfa (central African francs). The anesthetist Asunción Mangue was sentenced to six months less one day in prison, suspended from the exercise of her profession for the duration of the sentence, and fine of 500,000 cfa. It was also agreed to temporarily close the Espoir Bata Litoral medical center for the duration of the owner’s sentence, although the clinic is obliged to pay five million cfa to the survivors of the deceased as compensatory damages. Despite the proclamations of the CPDS party and other criticisms in this regard, the case has arisen from a most particular and private accusation from the family of the deceased patient, and was carried out under the guaranteed independence of the judiciary. The accused have been tried in the first instance, and can appeal the sentence, following the usual channels prescribed by the justice system. Wenceslao Mansogo has always exercised his political career as well as his medical profession with respect and freedom in Equatorial Guinea. To demand special treatment for Dr. Mansogo, accused by a private family, because he is a politician known abroad and belonging to the opposition, would be a clear distortion of the most important democratic and social values, and an attack on the right to the blind justice demanded by the family of the victim, who presented this complaint.